Toda Rai Singh is a small town in Tonk district. There are 10 historic temples and the temple of Shree Adinath Bhagwan contains very charismatic and old idol of Bhagwan Adinath. The origin is with the Bairath culture and civilization. It is said that in the 11th century Khoja or Khwaja gotra Jats weree found in Marwar, Ajmer, Jhunjhunwanti areas of Rajasthan. Khoja Ram Singh after a war founded Tonk town. Earlier this town was called Tonkra. The descendants of Ram Singh ruled Tonk for many years. In Akbar’s regime, the king of Jaipur, Man Singh conquered Tari &amp; Tokra Janpad. In 1643 twelve villages of Tokra was given to Bhola Brahmin. Later Bhola gave the name “Tonk”. Toda Rai Singh is a historical city situated in Tonk district and was established in the year 1901. It is surrounded by hills and this ancient is of great archaeological significance. In earlier times it was known as Takshakpur, Takshakagadha, Todapattan, Ishtikapur, etc. it was founded by Nagas in the 4<sup>th</sup> Century A.D. and this town was ruled by Chauhans of Ajmer and Guhilas of Chatsu. In 15<sup>th</sup> and 16<sup>th</sup> century, this town was capital of Solanki Rajputs. The town got its present name from Rai Singh Sisodia who was the famous ruler of this place. During the reign of Shah Jahan, he was a Mughal mansabdar. Toda Rai Singh is blessed with rich cultural heritage and glorious historical past. There are many historical places of tourist interest in Toda Rai Singh such as- Ruti rani Mahal, Gadh k Balaji, Neem ki Khan, Budh Sagar, Am Sagar, Hadi Rani ki Baori, Raja Rai Singh’s Mahal, Isar Baori and Bhopat Baori. The temples of Raghoraji, Govind Deo Ji, Gopi Nath Ji, and Kalyanji are also popular. Todaraisingh is one of the town in tonk district in Todaraisingh Mandal in Tonk Distric in Rajasthan State. It is 36 km far from the main Tonk City and 103 km far from Jaipur City. There are many temples in Toda Rai singh. The major temples include- Kala Pahar Temple, Kalyan Ji Temple, Laxmi Narayan Ji temple, Pipaji temple etc. The Kalyan Ji temple is famous for the statue of Lord Anirudh. This temple has famous architecture as that of Pratihars which was famous during the 9<sup>th</sup> and 10<sup>th</sup> century. The temples are famous for their pilgrimage from centuries which gives dedication to God. The temples are considered as the spiritual pilgrims in Toda Rai Singh. This place is considered as sacred and holy pilgrim for the Hindus and Jains. This ancient Temple Kalyan Ji is dedicated to God Shri Kalyan Ji who is believed to be an incarnation of Lord Vishnu. It is believed that about 5600 years ago, from the court of King Indra, an Apsara had to spend 12 years on the earth because of a curse. At that time, the King Digva offended her and the Apsara cursed him and the king become a leper. Then King Digva meditated to be free from the curse. One day the God was pleased and the King heard a voice from the heavens that his statue would appear at the seashore and the King have to install that idol to be free from Leprosy. King Digva brought the idol from the there and installed in this temple. The temple is built of stone and lime. 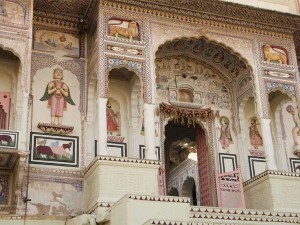 The temple is known for its marble work and the best architectural designs. The temple remains open from 4.30 A.M. to 9.00 P.M. on all days The Temple Complex has 14 other Temples dedicated to different deities.